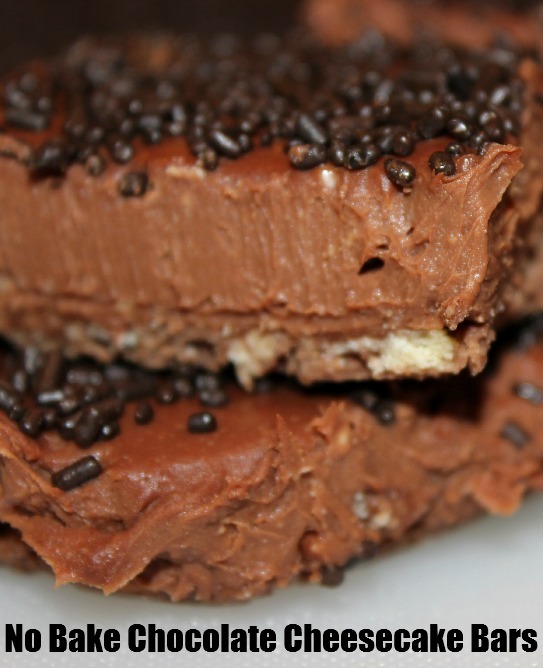 Serve up a batch of No Bake Chocolate Cheesecake Bars the next time you desire a sweet on a hot summer day! Easy to make, these rich, creamy and delicious No Bake Chocolate Cheesecake Bars are sure to satisfy your craving. • Line a 9″ x 9″ x 2″ pan with aluminum foil (NOT parchment paper). • Crush the sandwich cookies in a plastic bag, then transfer the crushed cookies to a large bowl. • Melt the butter on the stove, then add 1oz semi sweet chocolate (weigh it) and allow that to melt into the butter, stir to prevent scorching. • Pour the butter mixture on top of the crushed cookies in the bowl; mix well. • Press the cookie mixture onto the bottom of the foil lined pan. Use a fork to press – this will allow you to crush the cookies further, and move the cookie mixture around to completely cover the bottom of the pan. • Refrigerate cookie crust while making the cream cheese mixture. • Microwave the 8oz of semi-sweet chocolate and heavy whipping cream for 1-2 minutes until soft/melted. Stir at the 1 minute mark, set aside. • In a medium bowl, on medium speed with an electric mixer, beat the cream cheese until fluffy. • Add chocolate liqueur, beat well. • Gradually add the melted chocolate mixture to the cream cheese; beat until smooth. • Remove the cookie crust from the fridge, and spread chocolate mixture evenly over the cookie crust. 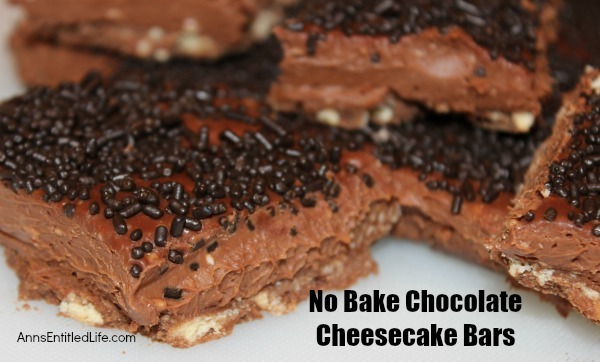 • Sprinkle the top of the cookie bars with chocolate jimmies. • Cut into bars to serve. These look so yummy and a light dessert!!! Any substitutions for the chocolate liquor? Jimmy’s (sprinkles) – those little decors you put on top of an ice cream sundae, Kristina. As far as a substitute, maaaaaybe (and I don’t know for certain because I have not done this) Hershey’s syrup?